I have had these headaches for close to 10 years now and it doesn’t seem to be going away. The headaches come from my lawfully wedded husband! I mean, how can a man not know how to keep his affairs closed? Why should I, as a wife be afraid to share intimate things with my husband? Every time we attempt to take a step, my husband is already out there sharing with every one who cares to listen under the pretense of soliciting for advice. He will even quote scriptures to support that the bible says in the multitude of counsel, there is safety. I have had it up to here! I have also found out that every time we decide to take a tangible step, once he lets it out in his pursuit of ‘counsel’, it becomes impossible to achieve. There was a time we planned to relocate to Canada. We had started the processing, and we seemed to be making a good progress when my husband came home and told me he discussed with some of his colleagues at work who in turn, told him that it’s not advisable to relocate when he has no family member that he could stay with in Canada and that was the end of that plan. There was another time we caught a glimpse of a better opportunity for him, we were still at the stage of fine-tuning it when he told some colleagues at work, and the following week, he was demoted and transferred to another branch of his office. There was another time we got a piece of land, and the day we were going to lay the foundation, we got there and I saw people waiting for us on our newly acquired piece of land. When I asked my husband who they were, he said they were well-wishers who had come to rejoice with us. What?! That was the last time we had access to that land because till date, both of us cannot explain how we lost the land. 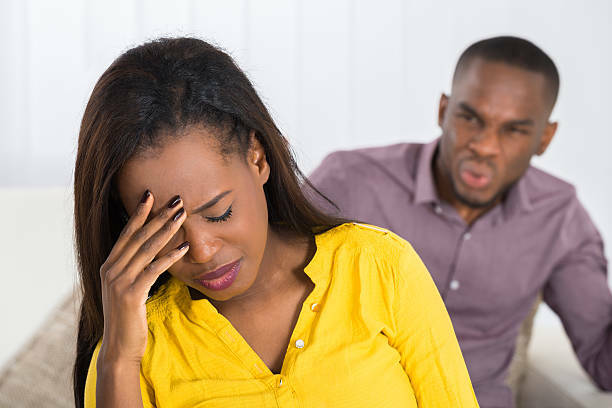 What made that particular encounter painful for me was that I had plans of going into a business around that period and because I know what my husband is like with information, I kept it to myself. I had an investor who was going to release 70% of the capital I needed. Could you believe that my intended investor was one of the ‘well-wishers’ my husband invited to our foundation laying ceremony? Needless to say, the woman said she didn’t think she could invest in the business again. Her fear was that I might diversify her money into our building project. I got promoted at work, my husband posted it on Facebook stating my new pay package. He said he was sharing testimony, that the bible says, “they overcame him by the word of their testimony…” I narrowly lost that new post if not for God’s grace. And I can go on and on and on about his inability to keep our family aspirations to himself. If there is anything we ever achieved, it was because I kept it away from him till the end and at such instances, we would quarrel and I would have to beg and beg before he would forgive me. Afterwards, he would start to taunt me about keeping plans away from him and not submitting to him as the head of the family. READ ALSO: Dear MIMsters: How Do I Make Peace With Mama After Doing This To Her? My office recently introduced a package to us on Real Estate, and it is what I can afford but I fear for it because of my husband. I can picture him sharing the ‘testimony’ and the venture failing again. Please advise me, should I go on and sign for this awesome package my office is introducing to her staffs and keep it away from my husband? Or how do I ensure that he doe not share this untimely ‘testimony’ before time. In all, he is a responsible man but he finds it hard to keep it locked down until it manifests fully. Thank you! Take the offer but don’t tell him. Hold on don’t ever be tempted to tell him until it all manifest. That’s who he is. You can’t change him. If you tell him, get ready to loose it, if not worst, I am talking from experience.